The changes in the Normandy weather never cease to amaze us here in the rolling hills of the Suisse Normande. Normandy is of course renowned for its interesting light and was the haunt of many of the greatest Impressionist painters (Cézanne had a summer cottage not far from here apparently) yet they too were amazed (and frustrated at times) at the weather here. The light of southern France is may be glorious but it is predictable. The light of Normandy is ever-changing. Impressionism is about the instantaneous– the fleeting. Capturing the essence of the passing moment. Impressionism is quintessentially Norman. 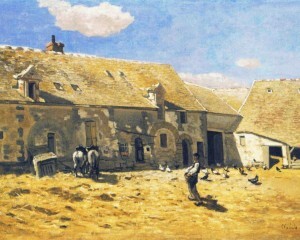 There is a farm like this one captured by Monet, just up the road from La Vieille Longère. And now the Impressionists are back in force. In 2010 Normandie Impressioniste was created . A stunning multi-faceted festival taking place through the summer. A second festival took place in 2012 and now the 2016 event has been launched. Normandie Impressioniste will include exhibitions, concerts, plays, films, sound and light shows, déjeuners sur l’herbe, riverside dances and guided walks. Almost every sizeable Norman community engages with the festival which stretches between Dieppe to Cherbourg, via Rouen, Honfleur, Lisieux and Caen. The theme for 2016 will be Impressionist portraits. We await it with as much anticipation as we do the next change in the weather… oh it’s raining again through the sunhine. Beautiful, rather like this little Renoir !